Sheep without Shepherds – Let The Bird Fly! In our culture a high percentage of individuals categorize themselves in the “none” category when it comes to their religious affiliation. It’s a category found in some surveys for young adults on college campuses. It’s even part of some forms as families take care of their loved ones upon their entrance into assisted living and nursing home facilities. The category “none” is there. In Numbers 27, we hear about a “Nun”. Except this “Nun” is not the type that is checked on a college or nursing home survey. (It’s not the type that lives in a convent either.) It’s the name of a father. His son was the one selected by the Lord to follow Moses. As there was a need for Joshua, son of Nun, for the Israelites, we can say that the story about Joshua, son of Nun, is fitting for us to consider as we reach out to the “nones” among us. The Lord is preparing Moses to be shepherded home to heaven. As that is happening, he has a special prayer. In that prayer there is a reflection of the love that he has for the people he has served. He asks the Lord to give them a leader. And not just any leader. He asks for a leader who would go out and come in before them. He asks for a leader who would lead them out and bring them in. Why? Moses knew the tendency of those he served. He knew their capabilities. Idolatry, revelry, disobedience, grumbling, rebellion, and unbelief were all part of their past repertoire. Without a leader directing them under the guidance of the Lord, they would be like sheep without a shepherd. They would easily fall into old sinful habits. The Lord answered that prayer by giving them Joshua, son of Nun. He indeed led them. He was a gift to them. We see that through the book of the Bible that bears his name. Stories would be told of the Lord’s deliverance. There were the stones set up along the Jordan River that would remind God’s people of their crossing into the Promised Land. That was done by God’s hand. There was the rubble formerly known as Jericho. That was done by God’s hand. The rock pile at Ai. Again, done by God’s hand. The list goes on. From an encounter with a prostitute who would be in the line of our Savior to the rest given to the people by the Lord after they had taken the land, all of this was done by the Lord. And then many promises given to Joshua and God’s people. Promises given by the Lord! Surely, the work done through Joshua would serve as an example for all to follow the instruction he gives. Surely it would serve as an example to listen to the promises he gives. And yet, we still have “nones” among us. A more fitting description of the “none” category would be “sheep without a shepherd.” What a sad and hopeless state that is. Think of how many “nones” there are in our cultural age. Ponder how there is the need for Joshua, son of Nun, as ministry is carried out among the “nones.” There is the need for someone to point them in the right direction. That direction is found in our Lord Jesus, our Shepherd King. “Sheep without a shepherd” was Jesus’ description as he saw the crowds (Matthew 9:36). Sheep without a shepherd is what we were and would be if the Lord had not put people into our lives to minister to us. Our capabilities are very similar to those of the children of Israel. Idolatry, revelry, disobedience, grumbling, rebellion, and unbelief are all part of our sinful repertoire. And yet God provided someone to direct us to him as our Savior. We had parents who brought us to baptismal fonts. They brought us to God’s house. They instructed us in our homes. We’ve had pastors minister to us with the Means of Grace. We’ve had others rebuke us when needed with the law and then comfort us with the gospel. They pointed us to Jesus. What a gift and blessing those individuals are! They pointed us to the one who has hemmed us in. The Lord follows behind us. The Lord goes before us. He’s brought us in. He surrounds us. Sheep without a shepherd is what we were destined to be. But Christ went before us to the cross. There he brought us out of the confines of hell and attached us to himself. There is now no condemnation for those who are in Christ Jesus (Romans 8:1). Instead, in Christ we have redemption through his blood, the forgiveness of sins (Ephesians 1:7). What a beautiful phrase that is, to be “in Christ”! There is a high population of “nones” that needs to hear this message. As God sent Joshua, son of Nun, to the Israelites at Moses’ request, the Lord continues to send proclaimers of the gospel into the world. Moses request continues to be our prayer. We ask the Lord to send people like Joshua as preachers. We ask the Lord to make sure their message is one faithful to his Word. We are a part of God’s answer. We ask the Lord to help us be those faithful messengers of our Savior. 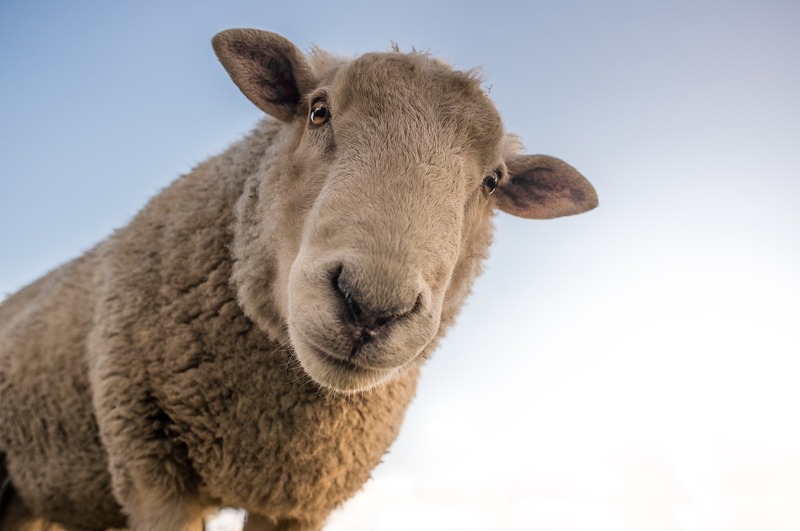 The “nones” around us are sheep without a shepherd. May the Lord bless both us as workers among them and our hearers.